Introducing Hippocamp – the smallest of Neptune’s seven inner moons. The recently discovered moon likely formed from a collision with another moon billions of years ago. New research published today in Nature describes a tiny moon in orbit around Neptune. The moon was first detected in images taken by Hubble back in 2013, but a new imaging technique allowed scientists to finally confirm its orbital configuration and some physical characteristics. 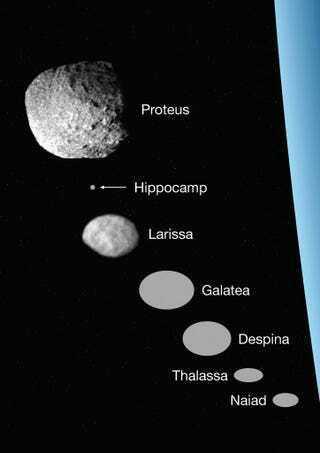 Named Hippocamp, it’s the ice giant’s seventh known inner moon and fourteenth moon in total. When NASA’s Voyager 2 spacecraft zoomed past Neptune in 1989, it imaged six previously unknown inner moons, but the probe missed at least one during its brief visit some 30 years ago, as the new research shows. A team led by Mark Showalter from California’s SETI Institute was able to confirm its existence. 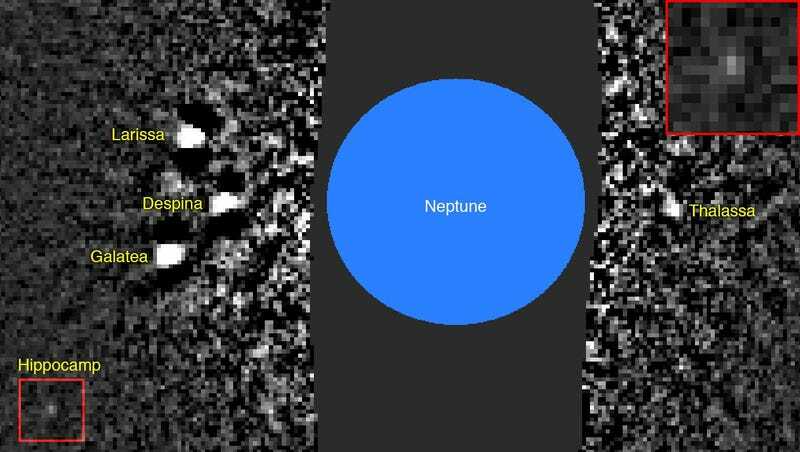 Hippocamp is now Neptune’s smallest known moon, measuring just 20 miles (35 km) in diameter. He also recommended the name because “Hippocampus” is the scientific name for the seahorse. Showalter is an avid scuba diver who enjoys watching seahorses in their native habitat, so he was naturally “delighted” when the IAU approved his recommendation. Astronomers classify Solar System moons into two general types, “regular” natural satellites like our Moon and “irregular” natural satellites, which are distant, captured asteroids in orbit around the four giant planets (Jupiter, Saturn, Neptune, and Uranus). The new study shows that Neptune has seven of these irregular moons. Jupiter, for example, has dozens. It’s not terribly unusual to detect irregular moons, whereas the discovery of regular moons is now quite rare; the last time a regular moon was discovered from Earth was in the early 2000s, when Showalter and his colleague Jack Lissauer from NASA Ames Research Center – a co-author of the new study – used the Hubble Space Telescope (HST) to detect two new moons around Uranus, an ice giant with at least 27 moons in total. Needless to say, finding a 20-mile wide object around a planet some 2.7 billion miles away wasn’t easy. What’s more, in addition to the long distance and the small size of the object, the astronomers were challenged by the moon’s rapid orbital speed, which made it difficult to combine multiple images and prevent smearing. Showalter’s team managed to collect eight five-minute exposures taken in sequence, which was done by “pixel-shifting” seven of them so they all matched the geometry of a reference image. Showalter was “elated” when the image appeared, but there was still plenty of work to do. Once his team knew the moon was there, they had to re-process all of the available data and perform more analyses to determine its properties and orbit. The new paper in Nature is now “the summary of everything we are able to determine about Hippocamp based on all of the available images,” he said. An interesting aspect of this discovery is that Hippocamp is very close to Proteus, which presented somewhat of a puzzle. As noted in the new study, Proteus is slowly spiraling outward on account of Neptune’s gravitational influence – but Hippocamp is currently in the spot where Proteus was located a few billions of years ago. The researchers speculate that Hippocamp formed from chunks of Proteus that broke off after a celestial collision, likely with a comet. And in fact, Proteus has a very big crater, which suggests it experienced a significant impact at some point in its history. Importantly, this can be taken as further evidence that Neptune’s inner moons formed from similar processes.